1 - Start the sauce by heating 2 tablespoons of the olive oil in a large saucepan over medium-high heat. Add the onion and garlic and cook for 3 minutes, until the onion begins to soften. Reduce the heat to medium and add the crushed tomatoes. 2 - Stir in the sugar, dried basil, dried oregano, 1 teaspoon of the salt, and crushed red pepper (if using). Bring to a simmer, partially covered with a lid, and stir occasionally while you finish the ravioli. 3 - To make the ravioli, place the chopped mushrooms in a food processor with the Parmesan, basil leaves, garlic, and oregano. Process on high for 30 seconds, until the mushrooms look nearly pureed. Pour into a bowl and stir in the bread crumbs, salt, and pepper. 4 - Bring a large pot of water to a boil. Working on a flat surface, lay out 20 of the wonton wrappers. Place a generous teaspoon of the mushroom filling in the center of each square. Brush the edges with water and place the remaining wontons over each scoop of filling. Press and pinch the edges to seal the ravioli. You can also use a scalloped cutter or a biscuit cutter to give the ravioli a round or scalloped edge. 5 - Boil the ravioli a few at a time for 1 minute, until they float to the top. Remove with a slotted spoon and transfer 5 ravioli to each of 4 serving plates. 6 - Finish the sauce by heating the remaining 2 tablespoons of oil in a medium skillet over medium-high heat. Add the sliced mushrooms and cook for 5 minutes, until tender. Toss with the remaining ¼ teaspoon salt, pepper, and parsley. 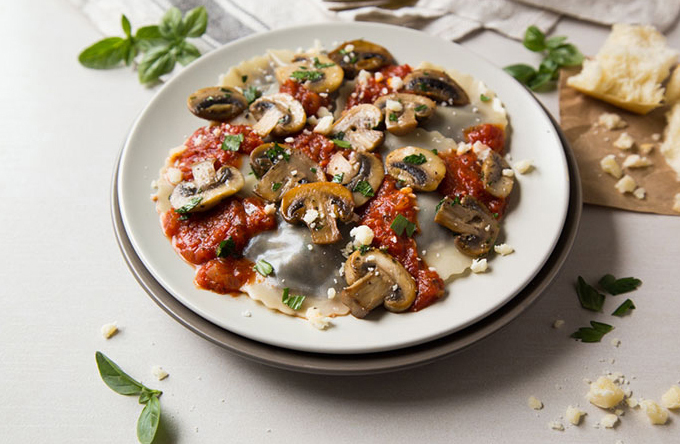 7 - Pour some sauce over each plate of ravioli and top with an equal amount of mushrooms. Garnish with Parmesan and chopped herbs when served.